We kept most of the old driveway for construction (so the heavy work trucks would have a solid surface to park on and wouldn't track mud from the job site all the way down our street), with plans to replace it with a paver driveway before moving in. That plan was derailed when the city instituted a new requirement for cement under the pavers in the right of way, which dramatically increased the cost. 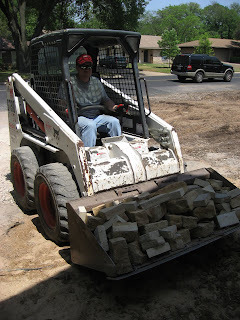 Since we already had decision fatigue (not to mention checkbook fatigue) by that point, we decided to hold off on finalizing the driveway plan until some later date, so we filled in the gap between the driveway and house with extra stones and bricks that we had on hand. That temporary driveway wasn't pretty, but it worked just fine as we continued to think through our options. We considered leaving the "apron" (the part where the driveway meets the street) as is and only putting pavers between it and the house, biting the bullet and going for all pavers with a concrete driveway underneath, using stamped concrete that looks like pavers...but all of these options were either impractical or cost more than we wanted to spend (especially with the huge landscape project still looming). 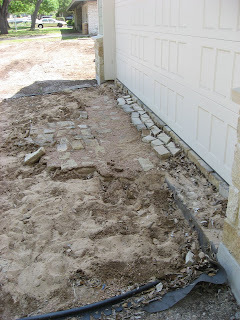 So we finally decided to go the simple route -- tear out the old driveway and put in a new one. When I saw the demolition underway Monday, I was struck by a feeling of relief at seeing the old driveway gone. They even tore out about ten feet of old, icky curb on each side. 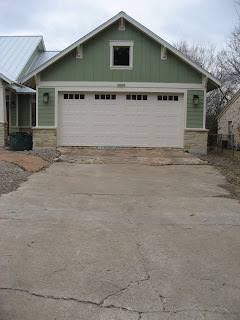 I realized the old, crumbly, poorly patched, mismatched driveway was weighing on me every time I looked at it. Seeing the house revert to a construction site was strangely satisfying. I was equally giddy Tuesday, when I learned that we had already passed the inspection that was supposed to have taken place on Wednesday, which meant that pouring the concrete was moving up a day. Seeing the forms and reinforcing mesh in place (albeit incomplete) was exciting. 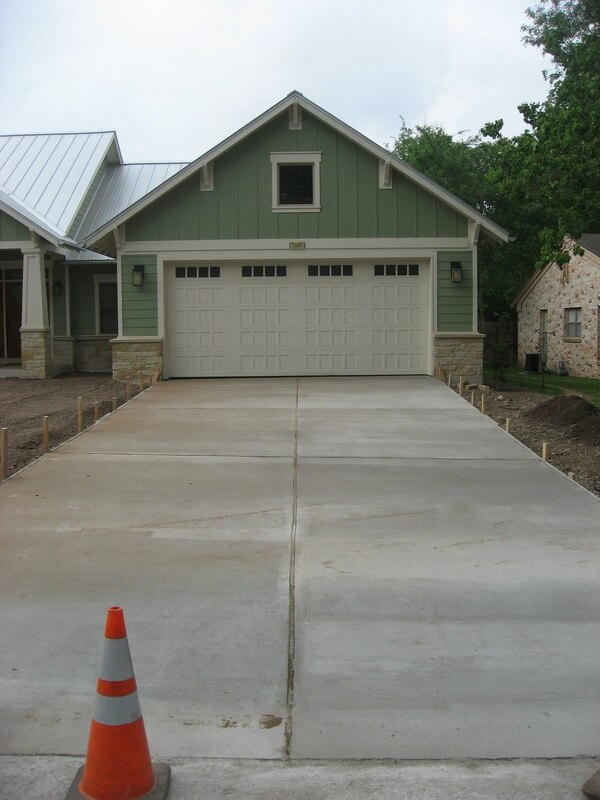 The city also makes them use an extra-sturdy cement in the right of way, which they also use for the rest of the driveway. That, plus the expansion joints they built in, should keep it from cracking like the old one did. And while the pour paled in comparison to the day back in December 2009 when the foundation was poured, it's always amazing to see concrete guys at work. After living with 31 feet of cracked driveway and 12 feet of cobble for almost a year, the driveway looks so long now. Like how vertical stripes are slimming, I guess. It tickles me that the house, with its brand new driveway and blank slate of a yard, has that brand-new-just-wrapping-up-construction look again. It's still, obviously, the ugliest front yard on the street, but neighbors are slowing down to tell us how good it's looking. (Like, lots of neighbors.) Can we pretend we didn't let nearly a year get away from us? awesome!I agree it is slimming... So crazy to me that it's been almost a year since we drove by and stopped to watch the wip. It's looking fantastic!